The Integrated Action Plan (IAP), government’s “development weapon” against Naxalism, is disintegrating. Conceived a year ago, it has been stifled by bad designing and highly centralised implementation formula. The plan has seen several amendments because of fights between government departments over control. The Planning Commission implements the plan, which is a component of a programme with similar objectives—the Backward Region Grant Fund (BRGF). This is implemented by the Ministry of Panchayati Raj (MoPR). After a year, we have more plans but little integration. IAP is implemented in 60 backward and tribal districts. Each district gets a block grant of Rs 30 crore as Central assistance. A district-level committee has the absolute decision-making power on expenditure. It is headed by the district collector and comprises the superintendent of police and the district forest officer. As per Central guidelines, the projects IAP funds must “show results in short terms”. As the Planning Commission drafts the 12th Five Year Plan, it wants to widen the programme’s scope. MoPR is insistent: the Planning Commission should call it quits. IAP’s fall was foretold before its evolution. The Union home ministry, responsible for curbing Naxal violence, conceived it under its focused area approach. It was planned for 34 Naxal-affected districts. In May 2010, the Planning Commission decided to implement it in 48 districts. Later, it added 12 more districts, none affected by Naxal violence. Government made it a component of BRGF. But, MoPR does not have any say in its implementation. In its present state, IAP is the anti-thesis of its original script. The government reasoned that the widening gap between the people and government left space for Naxalites to exploit. 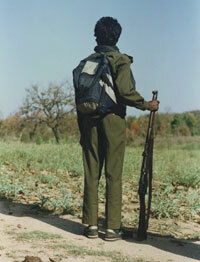 The government admitted that police and forest department’s brutality and restrictive regimes fuelled Naxalism. But under IAP, it put forest and police officials at the helm of affairs. The district committee is an entity not obliged to constitutional provisions. Most decisions the committee takes are the constitutional mandates of panchayats. Many Naxal-affected districts are run under special constitutional provisions listed in the fifth schedule of the Constitution. These give local communities and panchayats control over local development. IAP does not recognise this. Planning Commission members, including its deputy chairperson, opposed this, threatening not to implement the plan. But the plan continues with this structure. Commission officials and district authorities connect well through secured video-conferencing. But the disconnect continues between the district and the village communities. Encouraged by the regular connection with the Naxal-affected districts, the Commission now wants more programmes under IAP. For example, it recently brought the Ministry of Rural Development’s Integrated Watershed Management Programme under the IAP. Panchayats play a major role in planning and executing this. The government has also increased the cost of treating one hectare of land under the programme from Rs 12,000 to Rs 15,000 for districts. This means, IAP will gradually gobble up programmes over which local communities get a bit of say. It thus widens the governance gap instead of bridging it. But the Commission wants to administer, and has already drawn a plan to replace IAP. The programme to be named Central India Tribal Plan, consisting of mostly Naxal-affected districts, will be monitored by the Planning Commission’s Independent Evaluation Office. The programme will have blocks as the planning units. A cadre of officers, selected by the Commission, will be in charge of the programme’s implementation. For two years, they will prepare plans in consultation with communities and panchayats. We are yet to know what impact IAP had on local development, even if short term. What’s certain is that Naxalites have further expanded their presence. Government’s strategy of “security and development” in Naxal-affected areas needs more security of development rather than departmental fights. IAP does not ensure that. The IAP, as I feel, is designed against the norms and spirit of PESA Act that is one of the bests in paper emphasising upon community participation and ownership of development at the village/ community level. In Odisha, for example, while most of the areas that have strong Maoist presence are Schedule V areas where PESA Act should be followed in planning and implementing development programmes, most officials do not know if an act like this do really exist. While working on the particular subject I found one collector bieng ignorant about it; some district level officials think that PESA is a law to deal with issues relating to collection, procurement and selling of minor forest produces; a larger part of the political leadership - be it from the ruling party or the opposition - believes PESA to be the older version or the second name of FRA. What I realised after travelling in some blocks of Odisha identified as Schedule V Areas, I realised that true implementation of PESA would really change the scenario and the empowerment of communities and their leadership would leave little space for the extremists to exploit. On the other hand, it would also leave a little space for the bureaucracy and the mites in the system called administration to fool the communities to satisfy the greedy business communities who have their eye on the land and all other resources the communities own. So, it is obvious that the administration or bureaucracy that leads it doesn't respect the PESA Act and works for its implementation. That's why PESA has been a forgatten act in the state of Odisha where it got its first recignition! As it is rightly mentioned in the article, the departmental infighting combined with the power greed of the bureaucrats always needed programmes where they have an ensured authority and scope for manipulation. IAP is designed just to fufil the greed and desires of the bureaucracy. I doubt, if it really aims at countering left extremism that grows in places of misery, accute poverty and backwardness.